The RN to BSN program is designed for Associate Degree nurses who wish to return to school for their BSN. Given the advances in healthcare, increasingly complex patients, expansion of community health, and intricate technologies, many nurses feel the need for additional education. The program is designed to further nurses' knowledge regarding disease processes, evidence based practice, professionalism, ethics, informatics, community health, and leadership. The program prepares nurses to further their career or continue their education in graduate studies. Goal 1: 75 % of graduates will report advancement in work responsibility in current job. Goal 2: 50% of graduates will report advancement in new job that requires BSN degree within 3 years. Goal 3: 35% of graduates will report starting a graduate nursing program within 3 years of obtaining their BSN. WHY CHOOSE the RN to BSN PROGRAM at CCGA? The RN to BSN program curriculum offers additional opportunity for hands-on practical experience while providing the graduate with the requirements and expertise necessary to enter a master’s program of study in the field of nursing. Courses are offered in an online format. The highly affordable tuition, challenging curriculum and personal attention you’ll receive make the Coastal Georgia BSN an easy choice for working professionals. 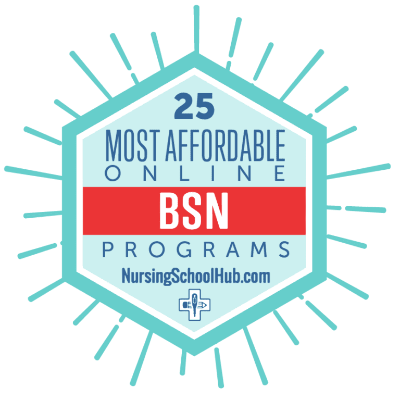 #1 in Nursing School Hub's ranking of the Top 25 Most Affordable Online Nursing Degree Programs 2019. Students in the RN to BSN program can choose to complete the program in three or six semesters (including summers). All coursework is completed online (Off-line clinical rotations are also required). Courses are taught by faculty experienced in online instruction. Students are admitted in the fall semester.and 9 semester completion options. All nursing classes are taught online. Have an active Georgia RN license (a copy of license to be submitted with application).